Please post or pass this Information on to people who you feel might be interested. Thank You. Benefit Concert at Munay Farm with Tito La Rosa, Ian Dogole and Special Guest Rene Jenkins This evening will include Peruvian snacks, Pisco Sours and an assortment of desserts. Saturday Night May 30, 7pm $40. Maximum 40 people $40. per person. What is a flower ceremony? - A Tito Tradition, Click here for a full description. Friday, May 29, 7pm, Friday, June, 5, 7pm Monday June 8, 7pm, Maximum 12 people $100 to $150 sliding scale. "The Chakana (square cross) is the symbol of symbols in the Ancestral Andean Tradition. It is said that it was not created and that it always existed. The Chakana is that which orders the universe, the space that is within and the space that is outside. Within the Chakana are contained the three worlds. The Hanan Pacha, The Uhju Pacha and the Kay Pacha. The Grandfathers and the Grandmothers of the tradition divided the world, the Chakana, into these three worlds, the Hanan Pacha, the world above, The Uhju Pacha, the world within, and the Kay Pacha, the world of the present or the here and now. This workshop-ceremony is a shamanic journey into these three dimensions of time and space and life. The Chakana is also a celebration of life and its diversity. It is a bridge to the cosmic, to the trancendent, and to ones interior. The Chakana is sacred geometry, it is sound and it is Light. In this workshop we will also work with the four sacred directions, with your chaupin, your center, your power, and your essence. This ceremony workshop lasts between four and five hours. $110. In the Andean tradition, Paqarina is a word and symbol which refers to the origin, which links us to the dawn, with birth and with life. Paqarina is the lake. It is the source, it is every place of and every moment of birth and every space that generates creativity and life. When we are creating, we are a Paqarina, when something opens within us, we are a Paqarina. Like all transcendental words, there exists in the meaning of Paqarina the idea of duality that is complementary, like the opening and closing of cycles, so that if there is to be a dawn or a beginning, a cycle has to be closed. The closing Paqarina weaves the possibility of the opening of a new time. In this process we ask ourselves, what cycle must end, what spaces should close, what part of me must die so that life can arise again, so that I can start a new cycle, and open a new space within me and in my life. This ceremony is a ritual of passage and of birth that allows us to close a cycle so that we can open a new cycle. We will have a sacred moment with the the sacred element of water and with messages from Grandparents from the four sacred directions of our Tradition to assist us to dissolve and purify everything we have to leave behind to make space for what we want to be born. On paper we will write and draw from a state of higher consciousness, exploring all that we want to release and transform from our past and our present life. Then we will visualize, and give breath and shape to our dreams together, working with nine sound vibrations of the Andean Tradition in a shamanic journey of inner transformation, life and birth. This ceremony is between 3-4 hours in length and is for a minimum of 8 people and a maximum 16 people. $100. 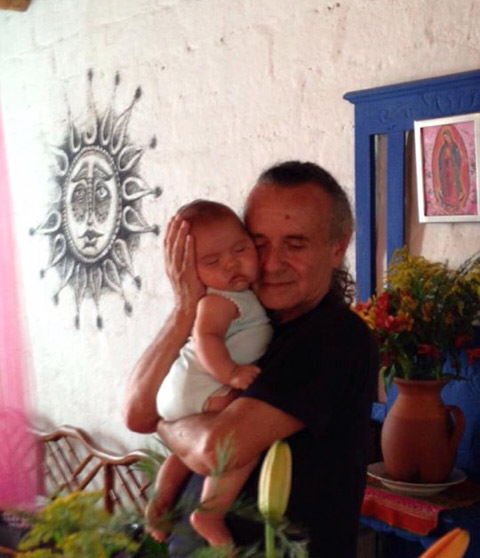 This class in sound healing from Tito's perspective, is an exploration of how to work with sound in a shamanic way to assist in healing. It is both demonstration and hands on practice and is different every time it is taught. One does not have to be a musician to participate. This work is based on the Andean Cosmovision or Mesa. An Andean Mesa is an altar with symbols of power from our tradition. The ancient Elders or AMAUTAS who were the teachers and guardians of the tradition, passed down to us symbols to be read and interpreted. These Symbols are an Oracle. An Oracle is a message, it is a symbolic path, a guide. An Oracle is a metaphor of Life. In this one on one session we work with the Andean mesa, a sacred altar of the Tradition along with the sounds and spirits of 13 musical instruments. The session lasts two and a half hours. $300. One person $350 for a couple. By appointment 415-990-9042. Tito is available to work with individuals on learning instruments that he plays or to assist students in working with their own instruments and sound healing practice. For more information or an appointment, please call 415-990-9042. As always we will are asking for donations for the Chaupin School. So far we have raised about $3,000. for this school year that ends at the end of December with the goal to raise at least $ 6,000. or more to complete the year. If you would like to "adopt a child" for the school year, a fifty dollar monthly donation, or donate any other amount please click here to donate. Thank you. If your interested in Tito's music remember that CDs & MP3s can be purchased online at www.SerpienteAlada.com.